Paternal twins, the 2016 Hyundai i30 SR and 2016 Kia Cerato Si are so close on paper – not to mention specification – separating them will be a difficult ask. Regardless, that’s what we’re going to do here with the newly updated Cerato hot off the press from its local launch. Few vehicles make more sense as an urban runabout than a hatchback from this small car segment – there’s more space and practicality on offer than some larger SUVs for example. The hatchback has really taken hold in Australia, a country that had very little love for them early on. Now though, they are as common a sight on the road as many other, more obviously popular, vehicles. Take a look around you and it’s fair to say you’ll be surrounded by vehicles such as the Hyundai 30 and Kia Cerato, not to mention the Toyota Corolla, Mazda 3, Audi A3, Volkswagen Golf and Mercedes-Benz A-Class. The revolution has well and truly taken hold. With the South Korean options now offering incredible warranty coverage, tremendous value, and locally-tuned dynamic attributes, there’s a lot to like about vehicles we never would have taken so seriously a few short decades ago. Now, Hyundai and Kia are right at the top of the consideration list in every segment they contest. Firstly, it’s worth noting that both these vehicles benefit from various campaigns with sharp drive-away pricing, so always check with your preferred dealer when the time comes to make your purchase. Here though, we’ve quoted current list pricing. As tested here in six-speed automatic guise, the Hyundai i30 SR starts at $27,890 (before on-road costs). Our test model is optioned only with metallic paint, costing $495. That takes the pre-drive-away price to $28,385. Budget-conscious buyers unable to stretch to the mid-spec SR aren’t forgotten, however, with the entry-level Active very sharply priced at $20,990 (before on-road costs). Standard equipment highlights for the SR include: 17-inch alloy wheels, LED daytime running lights, LED tail-lights, dusk-sensing headlights, a 7-inch touchscreen with satellite navigation, dual-zone climate control, proximity smart key with push-button start, electric folding mirrors, alloy sports pedals, premium gear knob and steering wheel, illuminated door handles and puddle lights. Starting at $28,990 (before on-road costs), the six-speed auto-only Kia Cerato Si, as in the Hyundai, is only optioned with metallic paint, this time costing $520. That takes its pre-drive-away price to $29,510. As noted in our launch review though, the new Cerato can be had as cheaply as $19,990 drive-away (at the time of testing). Standard equipment highlights for the Si include: 16-inch alloy wheels, a full-size alloy spare wheel, 7-inch touchscreen with satellite navigation, rear-view camera, dusk-sensing headlights, soft-touch interior materials, chrome interior door handles, premium steering wheel and shift knob, leather seat trim, rear air vents, auto up/down power windows, push-button start, electric folding mirrors, blind-spot detection, lane-change assist, and rear cross-traffic alert. Hyundai’s i30 in SR guise features a 2.0-litre four-cylinder engine generating 124kW of power and 201Nm of torque, matched to either a six-speed manual or six-speed automatic as tested here. The fuel claim is 7.7 litres per 100km with the automatic, while on test we averaged 11.2L/100km. The new Cerato (a little strangely) moves away from the previous model’s direct injection engine in favour of a 2.0-litre MPI petrol engine and six-speed automatic transmission. The four-cylinder makes 112kW and 192Nm while using a claimed 7.1L/100km. On test, we averaged 9.4L/100km. Both engines are quiet at idle and smooth during acceleration. The difference in power isn’t vast – the difference in torque even more minute – and you wouldn’t expect it to translate to huge differences on road either. It doesn’t in terms of speed, but the i30 definitely doesn’t need to work as hard as the Cerato does higher up in the rev range. What that means is you experience a more effortless feeling from the i30. Nothing to see here, move along. It’s a little bit like that old saying when you take a look at the exteriors of both these cars. The exteriors are very much stock standard hatchback fare, which means conservative but sensible styling, and nothing too flashy or outrageous. Both have attractive lighting and finishes, but the i30 pips the Cerato with slightly larger wheels and lower profile tyres. Of the two, the i30 is perhaps starting to marginally show its age now, with the Cerato, especially the front end, looking a little more contemporary. Styling is definitely a matter of personal preference though, and we found that the i30 still garnered plenty of comments directed toward its attractive styling. Where both these hatches excel is that even the base model variants still look attractive enough to cut the mustard on the road. Often the base model cars look too, well, basic, but not with either of these hatchbacks. It’s fair to say that if you’re looking at either of these South Korean alternatives, you want something more stylish than a Toyota Corolla for example. So there’s something to be said for external styling in this segment, even though some of you might find it a little boring. The i30’s steering wheel-mounted controls are cleverly positioned, never get in the way, and are easy to decipher, meaning you won’t need to look at them after the first few times using them – which it has to be said, is the idea after all. The Bluetooth phone connection is razor sharp, as we’d expect, but you won’t need it if you have a data cable anyway. That’s because the i30 has Apple CarPlay, and again, the system works flawlessly. Well tested and well documented at CarAdvice, it never fails to impress in how effortless it is to use. The 7-inch screen it’s partnered with is clear, rarely hard to see (no matter how harsh the light) and responsive to commands. The i30 also gets proprietary satellite navigation, meaning you don’t have to dip into your phone’s data plan to access mapping and turn-by-turn navigation. We’ve found using maps via your data plan doesn’t actually drain that much data in the real world anyway, but in-built sat-nav is a handy feature to have. The audio system is clear and crisp enough too, without being mind blowing. The Cerato doesn’t currently have the smartphone link system, but will be getting it as soon as licensing approval is sorted. Kia told us at the launch of the refreshed Cerato that the upgrade (once available) will involve a quick, half-hour ‘reflash’ performed at local Kia service centres. Like the i30, the Kia’s major controls are well positioned, easy to decipher and clear. Both vehicles manage to execute infotainment that some more premium – and significantly more expensive – European contenders can’t seem to get properly sorted. Once again there’s precious little to separate them. Taking a look at the i30 first, the interior is attractive, well-appointed and cleanly executed. The cloth material used for the seating looks to be hard wearing and is comfortable, even after a few hours in the saddle. There’s more than enough legroom across both front and second-row seating positions, although, the middle of the back seat isn’t ideal for taller adults on long drives. There’s plenty of clever cabin storage, and luggage space beyond what you’d expect of a small hatchback too. The packaging and design of the interior is well thought out. We liked the visibility from the driver’s seat and the i30 is easy to position, no matter how tight the driveway or parking space. The Cerato edges the i30 in the cabin though, with quality leather trim (‘premium trim’ in Kia speak) as standard. The seats are comfortable in the i30, but the leather trim in the Cerato is a definite step above the cloth in the Hyundai’s cabin. Some of the Cerato’s plastics are a little on the harsh side, but are soft touch where elbows are likely to come into contact. The Cerato also has plenty of legroom in the second row and more than enough luggage space to take a heap of gear as well. The external dimensions might be compact, but both these hatchbacks could quite easily serve duty as second family vehicles. Surprisingly, it’s here where the i30 and Cerato display their most significant differences. Both vehicles have local suspension and steering tunes, but there would no doubt be subtle differences given different engineering teams worked on each vehicle over different roads and in different conditions. Where the Cerato is a more comfortable ride – in outright terms – the i30 feels a little sharper, a little more ‘sporty’. You could say that is befitting of the SR badging, but remember that the SR is still considered a mid-spec i30 in the range spread. 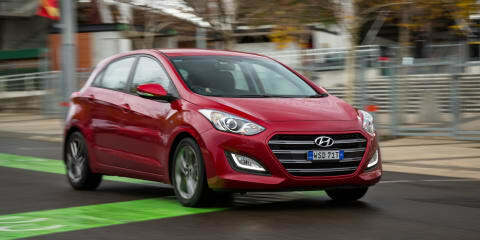 The i30 has a precise feel to the steering and that solid bump absorption quality that proper sporty handlers deliver. There’s no banging or crashing, no bottoming-out – even over really poor surfaces – and mid corner bumps don’t unsettle the line you’ve chosen through a corner once you’ve committed. The engine and gearbox both seem content to be worked hard too, with the i30 not feeling quite as rapid as we’d like (or expected) but still feeling sharp enough to have a bit of fun if you’re in the mood. Those of you hoping for a ‘hot hatch’ in the true sense of the word, need not apply here. I hate the term ‘warm hatch’ if I’m honest, but if ever it was to be used, it’s in regard to the i30 SR. The extra performance on offer – compared with the Cerato – was reflected in the heavier fuel use noted on test, which is a factor some buyers won’t worry about, especially if they desire a slightly more sporty driving experience. 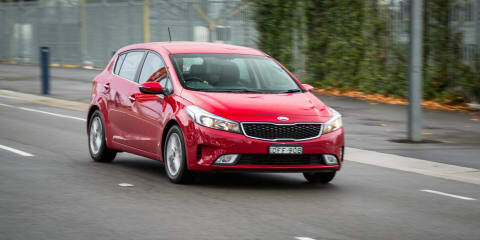 One thing became immediately clear at the recent launch of the Kia Cerato: if you prefer a spongy, more cosseting ride, the entry-level Cerato S – with its smaller wheels and thicker tyre sidewalls – is the best of the bunch. That means that the mid-spec Cerato Si rides a little firmer, while still being comfortable around town. The engine in the Cerato needs to be worked harder to get you up to speed than that in the i30 – especially highway speeds – but it’s an honest workhorse around town, where it is smooth and quiet. Higher up in the rev range you can hear it working hard though, and it’s a little on the raucous side. Driven normally though, the Cerato returned a more impressive fuel figure than the i30. Like the i30, the Cerato is predictable, safe and enjoyable to drive under any conditions and it is likewise quite and insulated inside the cabin over a variety of surfaces too. The gearbox shifts smoothly too, another notch in the belt of the conventional automatic ‘box. On road, the message that comes out loud and clear is that while the i30 isn’t really a properly sporty hatch, there’s something about it that feels sportier than this Cerato. That’s not a negative for the Kia mind you, different buyers will want different things. Both impress in their refinement though, especially for the money they are asking. The Hyundai i30 is covered by a five-year/unlimited kilometre warranty and a 12-month complimentary roadside assistance program. There’s also a 60-month capped-price servicing plan for the i30, with services every 12 months or 15,000km. Those services range from $249.00 to $349.00, meaning total servicing costs over the the first 60 months/75,000km add up to $1345.00. Kia has the industry-leading warranty plan and the Cerato is therefore covered by a seven-year/unlimited kilometre warranty (and seven years roadside assist), which puts the South Korean brand at the head of the class. There’s also a capped-price servicing plan up to seven years as well. The Cerato requires servicing every 15,000km or 12 months. The services range in price from $289.00 to $487.00, meaning the total over seven years or 105,000km is $2579.00. As we thought from the outset, this contest was always going to be extremely tight and that’s the way it panned out. We couldn’t split the two in terms of scoring (with both deserving of an eight overall), but there is a distinct difference between the Hyundai i30 SR and Kia Cerato Si for potential buyers. If you need, or want, a modicum of sporting pretension, the i30 is the one to buy. A week behind the wheel leaves us in no doubt of that. The i30 is not a hot hatch by any means, but it is a little more performance-focussed than the Cerato. The Cerato, on the other hand, is the more comfortable option and feels a little more premium and expensive, largely thanks to the leather trim and cabin ambience. Regardless which hatch you choose, both these South Korean options are excellent choices in a segment that doesn’t always make buyers feel good about their purchase decisions. Click on the Photos tab for more Hyundai i30 SR and Kia Cerato Si images by Brett Sullivan.